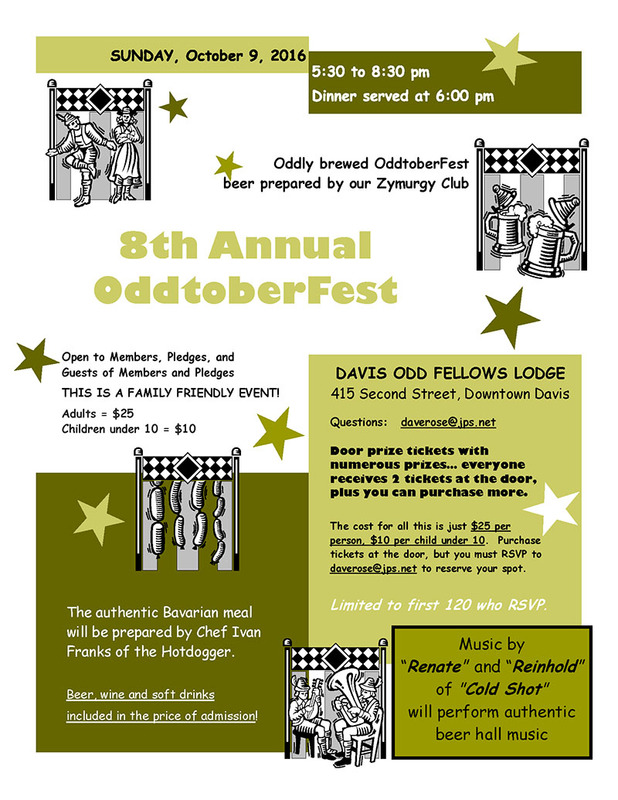 The Davis Odd Fellows Lodge is now accepting RSVP’s for our unique “OddtoberFest” – open only to members, pledges, and guests of members and pledges. This is our EIGHTH annual OddtoberFest. This year, the OddtoberFest is Sunday, October 9, 2016 at the Davis Odd Fellows Lodge, 415 2nd Street, in downtown Davis, from 5:30 to 8:30 p.m. The OddtoberFest features a Bavarian-style meal, German music, special Fest beer brewed by our own Zymurgy Committee, and lots and lots and lots of door prizes. It’s always a fun event, and it is family friendly. Once I record your RSVP and your payment, I will turn over all checks to the Lodge Financial Secretary.